Doolin in County Clare, Ireland is the perfect spot for a short midweek or weekend break in the west. This quaint village positioned on the western seaboard, along Ireland’s famous Wild Atlantic Way, makes it a holiday destination like no other. With bucket loads to explore in Doolin and its surrounding area, there is something for every visitor to enjoy. Explore the spectacular region of The Burren, take a boat trip to the Aran Islands and experience the majestic Cliffs of Moher. Situated on the south-western edge of the Burren and on County Clare’s rich coastline, Doolin is conveniently located within close proximity of each – making it the perfect base to discover all the natural wonders and magical views that the area has to offer. The picturesque landscape around Doolin itself is waiting to be explored on foot, by bike, by car or private chauffeur – information on local guides, bike rental and walking itineraries is available from the local Tourist Office or throughout the Doolin Tourism website. Don’t forget your camera and outdoor gear! There is a great sense of community in Doolin and not just among the locals. 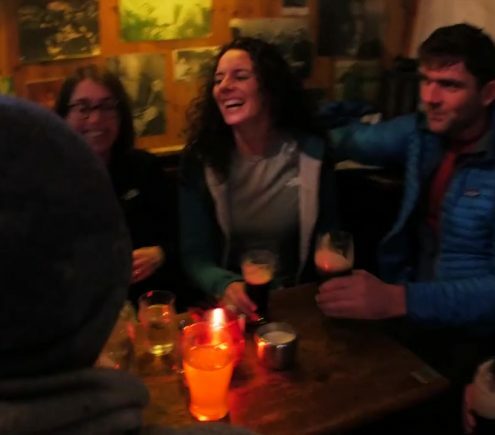 Doolin is a place of storytelling, with stories from all over the world being shared over a pint of porter in the local pub, a coffee in one of the artisan cafés, a meal in the local restaurants, with your accommodation host and so on. Doolin is the perfect place to meet people, get talking to local people who are all very knowledgeable of the area, and truly experience Irish hospitality at its finest – from the minute you arrive, until the minute you depart. Doolin has a long-standing reputation as the home of Ireland’s traditional music and folk scene, with year-round trad sessions in its local pubs and more recently, a series of summer gigs, concerts and of course, the popular Doolin Folk Festival. 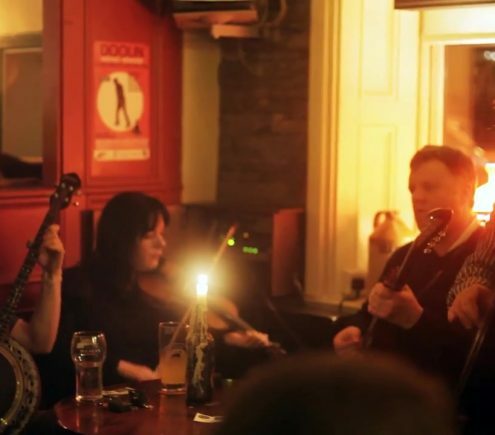 A visit to the Doolin Music House and local pubs such as Fitzpatrick’s Bar will surely keep you entertained each evening of your stay. More info on music here. Conveniently located within the Burren and Cliffs of Moher Geopark, Doolin is a great base for experiencing new adventures on land and water! Journey to the Great Stalactite at Doolin Cave & Visitor Centre, climb aboard Doolin2Aran Ferries’ brand new Star of Doolin ship or experience The Doolin Ferry Company’s new ‘Bus & Boat Tour’, and explore the Cliffs of Moher and Aran Islands. For high-adrenaline adventurers, there is a selection of activity operators in the surrounding area. 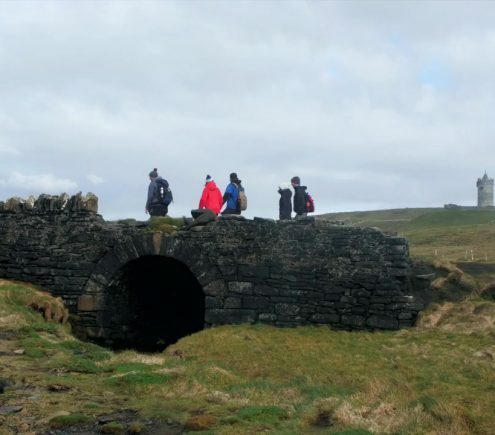 Dig out your hiking boots or cycling gear and take a guided ( or self-guided tour of the area and discover its beautiful scenery and geological features. Private drive tours are also available for those who prefer a little bit of luxury. More info on adventures here. Doolin has a great selection of accommodation options to cater for all tastes, budgets and requirements. Choose from Hotels & Guest Houses, Inns, B&Bs, Hostels, Welcome Standard Speciality Lodging, as well as holiday homes to hire or campsites for caravans, campervans or tents. A great night’s sleep, coupled with fantastic local food and exceptional service makes Doolin the perfect getaway for a relaxing break with your loved ones, friends or even by yourself for some “me-time”. More info on accommodation here. Guinness, Irish whiskey, Irish coffee, “The Fry”, Irish stews, vegetable soup and soda bread, potato cakes and fish and chips are just a few of the traditional dishes and beverages that are on offer here in Doolin. 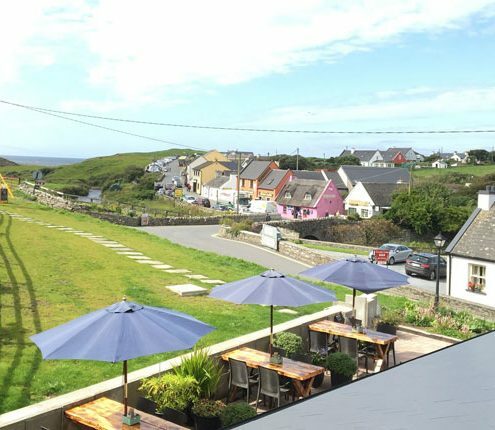 If you’re looking for pub grub, fine dining or something in-between, Doolin is the place to enjoy all of these in both relaxed and vibrant dining atmospheres. 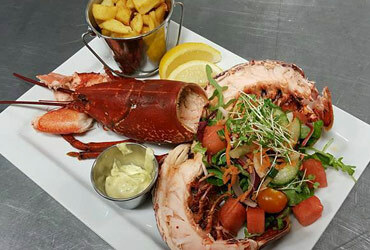 The local eateries are stocked with all the best local produce, craft beers, wine and Irish favourites. Come and experience the tastes of the land and sea! More info on dining here. Doolin is a hub for art and local craft, with shops and cafés displaying some of the finest locally inspired artwork, woodwork, jewellery, fashion, textiles, souvenirs and more. 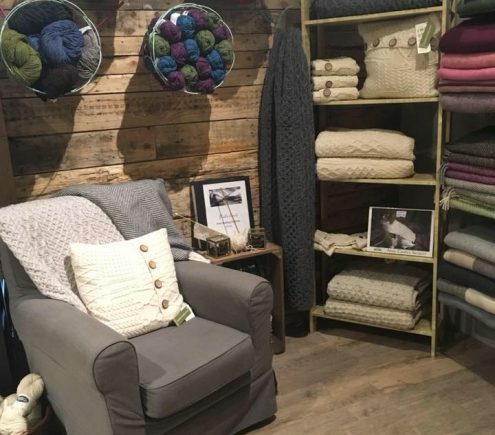 Whether you’re looking for a unique gift or something for yourself, the craft shops in Doolin are full of hidden gems and fashion-forward collections. A much more evolved infamous “Aran Sweater” can be seen in most establishments, alongside contemporary and indeed luxurious, locally sourced/crafted products. Irish Crafts in Doolin are kindly offering all customers to their shop this August, a complimentary Doolin Postcard & Bookmark Set. Find out more here. More info on art, local craft & shopping here. 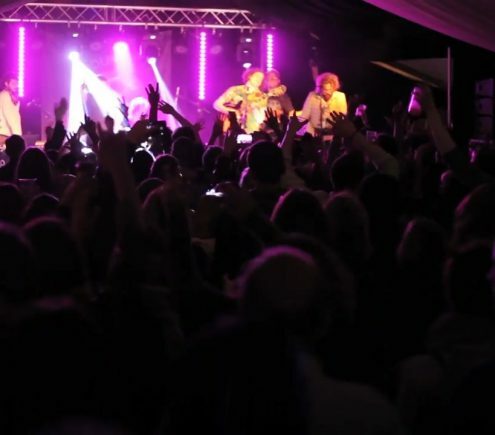 Doolin is native to a number of local food events, music events, charity events and festivals such as the Doolin Folk Festival and the neighbouring Matchmaking Festival in Lisdoonvarna – all of which attract visitors from all over Ireland and the world each year. Click here to find out what’s on in Doolin and start planning your next trip! More info on festivals and events here. 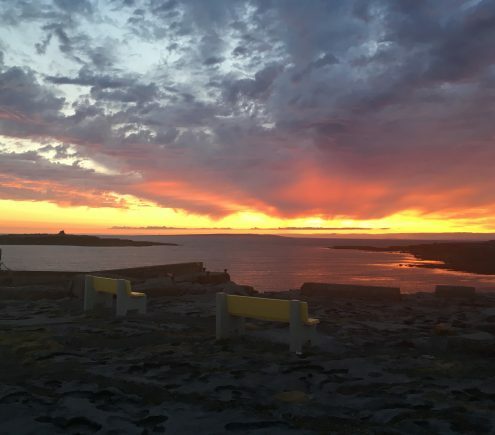 Doolin is one of Ireland’s most spectacular places to watch the sunset. Don’t believe us? 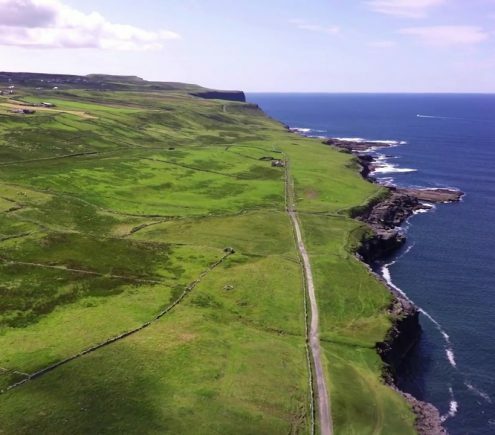 Check out this article by IrelandBeforeYouDie.com – the view from Doolin Pier made it to Number 1 on the list! Another great spot is from the ruins of Killilagh Church & Graveyard and if you’d like to get a great view of the sun setting over the sea while sitting down to a nice meal and a glass of vino, check out the terrace in Anthony’s at Doolin Inn. It doesn’t get much better than that! That concludes our 9 reasons why you should visit Doolin – of course, there are a lot more reasons but we wouldn’t want to spoil your sense of discovery on your next trip! Be sure to explore the rest of our website to find out more information, or to plan your next visit to beautiful County Clare.